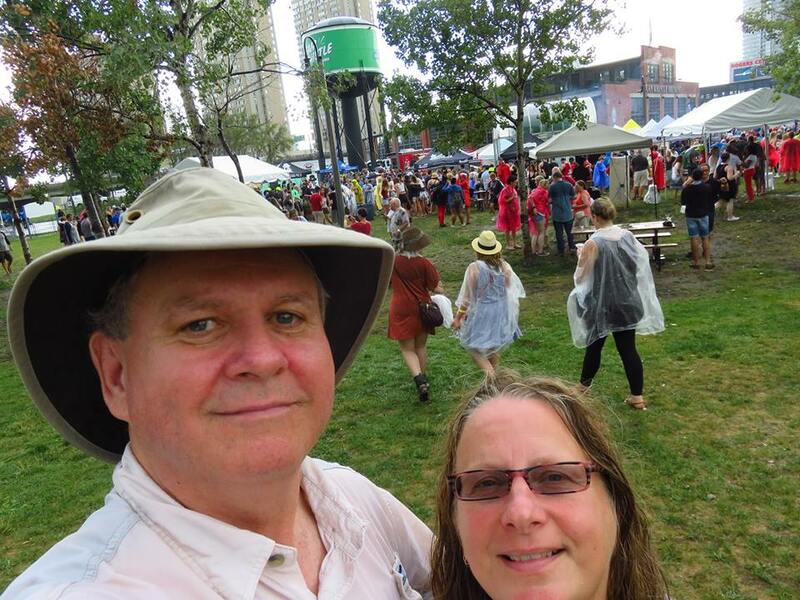 Today Teena and I were at the 4th annual Roundhouse Craft Beer Festival. 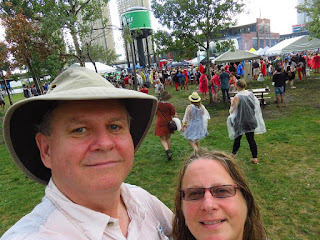 We have been to all four summer festivals plus two winter festivals they have held. The beer is always good, the people who attend all friendly, but today it was also a battle against the elements, extreme heat and rain. It was hot just standing in line to get in. Right away I went and had a delicious pale ale from Maclean's Ales. Next up was a Sunlight Park Saison from Left Field Brewery. I made a new friend from Barnstormer Brewery. They make a great Flight Delay IPA. A nice Waterfront Wit from Walkerville Brewery. I went back later for Geronimo IPA. 10 minutes later, bright sunshine! The Hibiscus Saison from Royal City Brewing was delicious. I had never heard of Stouffville Brewing Company and enjoyed their Red Falcon Ale. I made two visits to Black Oak Brewing. The first for their Beat the Heat wheat beer. I returned later for their ultra delicious Ten Bitter Years. Ominous clouds came rolling in bringing some more rain with them. Then 10 minutes later, blue skies. An IPA from Stack Brewery, who came down all the way from Sudbury. More rain. Finally Teena and I said to heck with it and just sat at a picnic table and let it rain on us. A beer from Lost Craft Brewery. I really enjoyed the ESB from Hendersons Brewing. Some people took advantage of the shelter provided by the caboose from the Railway Museum during the rain. I really like Monty's Ryed Pale Ale from Old Tomorrow. We both had a Stax from Chimney Stax Baking. It is a rolled cheese bread. I had mine with bacon and it was fabulous. I love Brimstone's Brewery's Sinister Minister IPA. We were still hungry and I was happy to see Teena return to our table with meat pies from The Pie Commission. It was filling and really good. My last beer of the day was pour by a shy lady from Lake of the Woods. Teena and I had another fun day at this festival. It's not one to miss.